We often get asked about where (and how) to find freelance writing jobs online. Many of you would like to give it a shot but aren’t quite sure where to find the right freelance writing opportunities. So, we decided to put together a list of resources for you to get started with. Don’t be afraid to start small, develop some experience and just get yourself out there. The most important thing is to….Just start. Having the right writing skills before you can start scouting for paid work is important. the better your skills the higher your chances of getting more work that pays better. 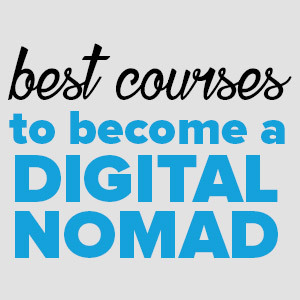 if you search the internet you’ll find lots of writing courses that you can consider taking. Upwork has a huge variety of freelance writing jobs ranging from blogging to web content writing, academic writing to ghostwriting and copywriting to screenwriting and many more. Short and long term jobs are available and the pay range varies depending on the job and freelance writing experience. Freelance Writing Jobs is an online writing job board that updates links to available writing gigs on a daily basis. You can also find helpful writing tips. 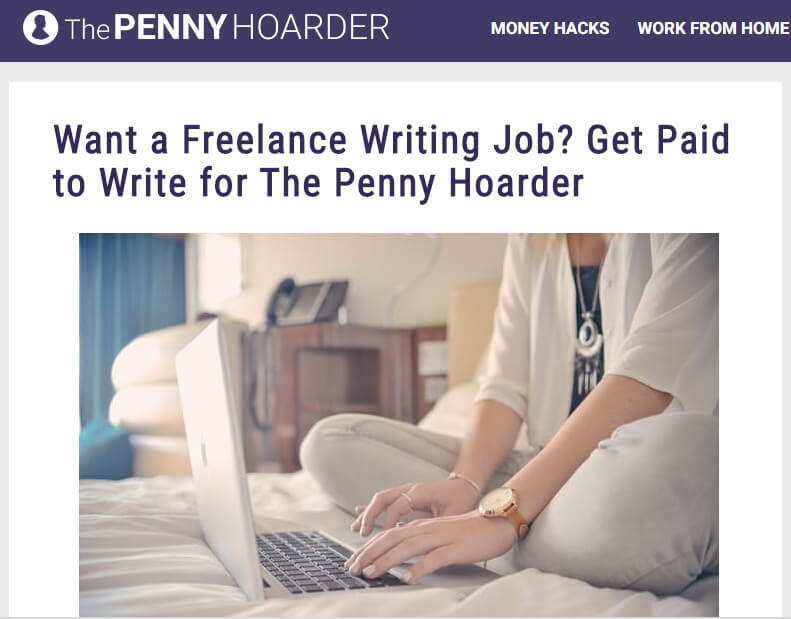 Freelance writing gigs have hundreds of jobs suitable for copywriters, content managers, editors, bloggers, reporters, columnists, and journalists. People Per Hour is another popular online bidding jobs site where skilled freelancers bid for available projects in various areas such as design, sales and marketing, web development and writing and translation. As a writer, when you join the site you can search for jobs and place a bid or you can post an ‘Hourlie’, which is an ad of the service you want to provide and the price you will charge. Freelancer is another popular freelancing platform. The site offers thousands of different jobs including writing jobs. To get a writing job, you will be required to participate in a contest in order to prove your skills and if you emerge the best contender you get the writing job. Competition is high on Freelancer and if you are a beginner, it might be hard to get your foot in but keep trying! Problogger Jobs is an online writing jobs board that features thousands of paid writing opportunities. The majority of the jobs are blogging-related as the site attracts mainly bloggers. There are a few other writing related jobs so it’s still worth a look even if you are not a blogger. Applications to the jobs are sent directly to the clients either via email or submission forms. Text Broker posts a variety of freelance writing jobs on a daily basis and attracts writers with any kind of experience, including beginners. The site is however available to US citizens and residents only. You will be required to give proof of citizenship when signing up on Text Broker. Upworthy is an online media company that publishes stories about important issues with the aim to change the world. Upworthy pays $150-$200 for 500-word posts. These should be original stories that support the company’s mission of creating a better world. MediaBistro has many jobs for skilled and experienced writers. The site lists TV, publishing, magazine, social media and PR/marketing jobs. The pay is quite competitive especially if you are highly skilled. The drawback however is that many of the jobs are available to US citizens only. Morning Coffee Newsletter is a weekly e-newsletter that is open to freelance copywriters, bloggers and editors. 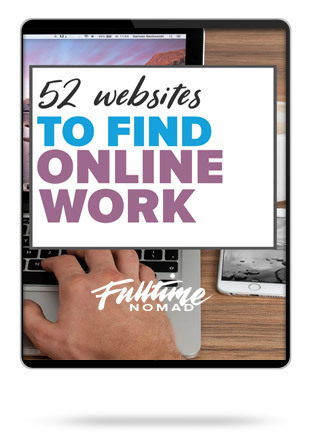 The site handpicks relevant job posting from popular freelancing sites. Check out the job ads to find one that fits your skills and apply according to advertiser’s instructions. You can also sign up to job notifications and receive emails about potential job opportunities. Craigslist is popular for all kinds of listings, such as rentals, stuff on sale, local news, online personals and even reliable jobs! Craigslist may not have crossed your mind as a reliable job site – but it does work. 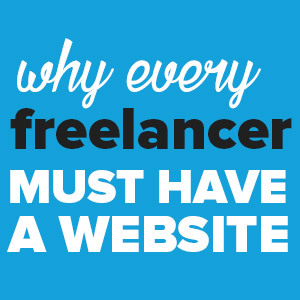 Though highly overlooked, the site actually has a good number of freelancing writing jobs. Craigslist is especially good if you want to start out by finding freelance writing opportunities within your town/region. The Writer’s Job Board posts blogging, content writing, and copywriting jobs that you can apply to depending on your skills and interests. 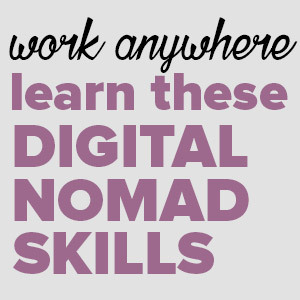 The site focuses on remote and online writing jobs. To find a relevant job run a keyword search or use location to search for available jobs. WritersWeekly.com is an online publication that provides news, updates and tips on various type of writing. The site has writing jobs such as self-publishing, corporate writing, ghostwriting, writing for markets of a specific genre, unique book marketing ideas,etc. 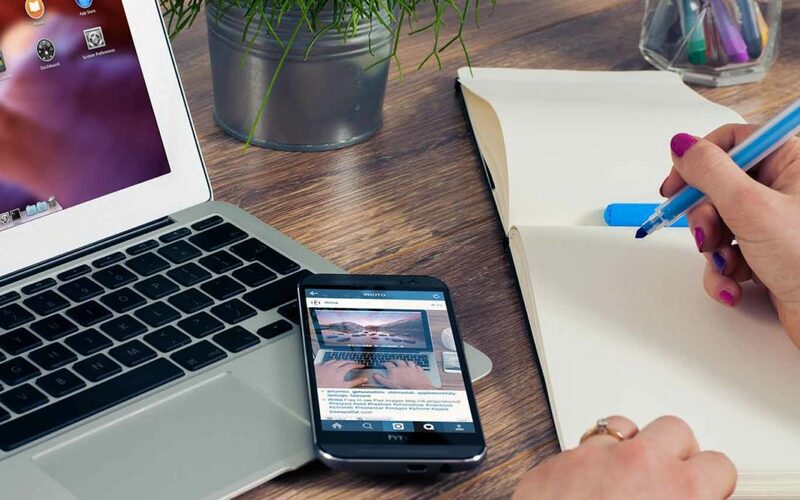 To get your work published on the site, you are encouraged to pitch your topic, referred to as a query, to the editor and if your pitch is accepted you can then send your full article of 600 words and get paid $60 for it or $40 for a 400 words post. Indeed is jobs search engine that curates freelancing job opportunities posted on thousands of websites. Some clients also post jobs directly on the site. 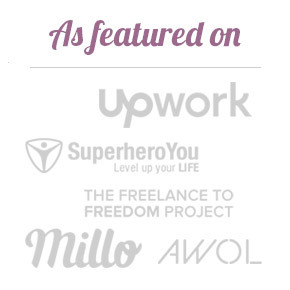 You can find a variety of freelance writing jobs on the site. Be sure to experiment with different search terms as well. Online Writing Jobs is a freelance writing service that allows writers of all skill levels and experience to find writing jobs online. To get started on the site, you will be required to create an account and complete an original writing sample/test used to gauge your writing skill, style, flow and ability to follow provided instructions. 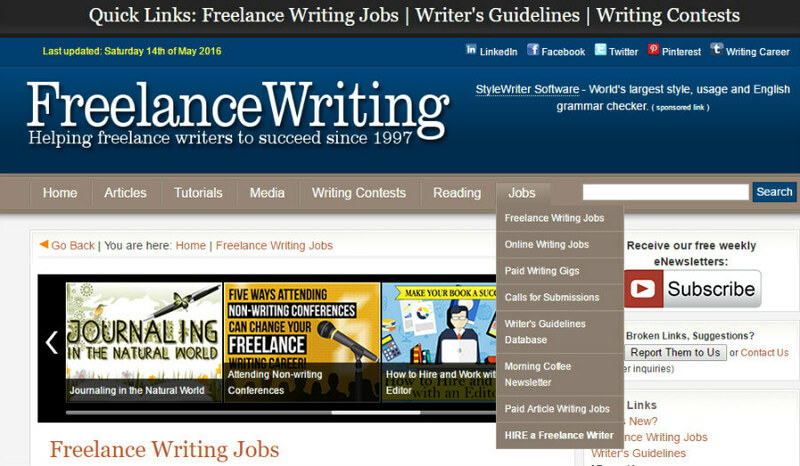 FreelanceWriting.com updates real-time paying freelance writing jobs for freelance writers every day. The site also researches and lists the newest writing contests, writing fellowships, screenwriting contests, and journalism scholarships that you can take advantage of. Journalism Jobs lists available writing jobs in newspapers and wires, Digital Media, TV and Radio, magazines, nonprofit, academic institutions, government, financial services, newsletters, Public Relations, trade publications and technology sector. All the job listings are available in the US. You don’t need an account on the site to apply to the jobs, but posting your resume increases your chances of getting hired. Listverse publishes lists that intrigue and educate and specialises in the bizarre or lesser-known trivia that also evoke humour. 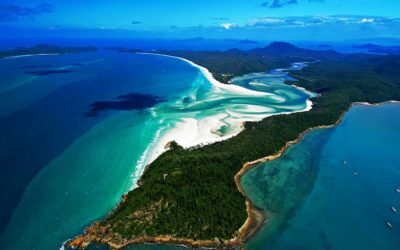 The site welcomes unique lists on unusual stuff that are at least 1,500 words long and will pay $100 per list. The Penny Hoarder is part of the Taylor Media family, an American digital media company. The Penny Hoarder publishes fun, unique ideas about earning, saving or investing money. 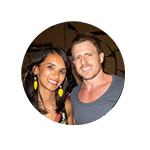 The site is especially interested in personal experiences with detailed numbers, strategies and advice. The site once in awhile also has openings for full time editors and writers. Pay is not standard but negotiable when you are pitching your topic. Reverb Press is a news and lifestyle webzine where you can regularly submit articles on topics you are passionate about. Writers who are accepted to write for Reverb Press are expected to provide articles on a regular basis. The amount paid depends on your output and audience engagement. Cracked publishes articles about insights into current events, pop culture, comics, video reviews, infographics etc. The site is particularly interested in short content that can be read in a minute or less, popularly referred to as “Quick Fixes” on Cracked. Full-length feature articles start at $100 each, veteran writers earn $200 per article. If your article is among the ten most popular in a month, you get a $50 bonus. FundsforWriters is an online resource for writers that not only provides job listings but also information on the available writers’ funding streams. 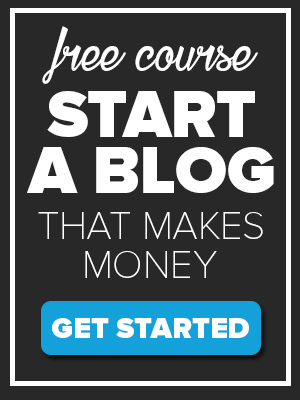 If you want to write and be paid, the site accepts success stories and practical advice from writers aimed at helping writers earn funds from writing and pays about $50 per article. The site accepts all submissions via email. Brazen publishes content helpful to recruiters, university professionals and HR professionals. The site will pay for posts in form of list focusing on networking events in various cities and articles that help recruiting and HR departments attract, retain, and engage top talent. All submissions are sent to the editor and payment is prearranged and is on a case to case basis. 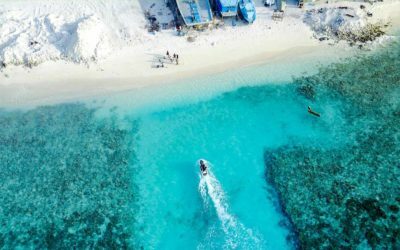 Great Escape Publishing publishes travel articles on their blog and The Right Way to Travel newsletter. 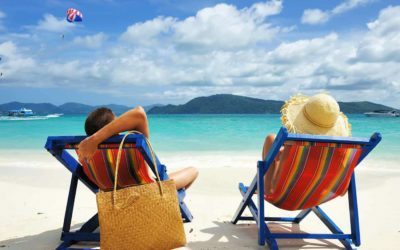 The company has a preference for articles that help their readers get paid to travel. 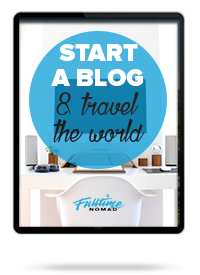 If you’re a travel blogger you can send your articles to the editor through email. The pay is $50-$75 for general travel articles, $100-$150 for interviews and personal stories, and $150-$200 for articles with specific income advice. Smashing Magazine publishes content for the web development and design community. If you have valuable tips, tricks, ideas or techniques to share send the editor a rough draft of your article. The pay will depend on quality and word count. 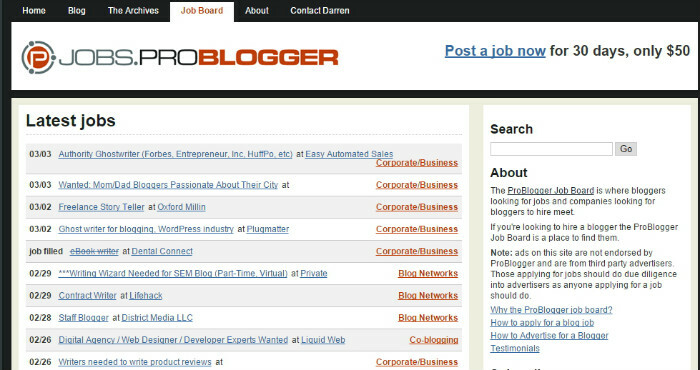 Similar to the ProBlogger job board, BloggingPro lists job opportunities for bloggers. Topics and niche areas vary and the list is updated daily with new job listings. Tip 1: Truth is, freelance writing is an extremely competitive space. There are hundreds of wannabe writers entering the space every day so it will seem overwhelming sometimes – we get that. But, you must also remember that many of these writers don’t produce good quality work and if you can deliver great work, clients will love you. Quality writers who stick to deadlines and do what they say they will do are rarer than you might think. Tip 2: Finding a writing job can take time at the start. You might see all the low paying work and become frustrated. But, there are good jobs out there. Be patient. It takes time but it’s not impossible. These aren’t empty words, we’re speaking from experience. Tip 3: Finally, in addition to the resources above, don’t be afraid to jump on Google and do your own research and find less heard-of opportunities. For example, if you are a health and wellness writer, start looking for specific health and wellness writing opportunities such as blogs and magazines that pay their writers for content. There are many paying markets that are specific to certain niches such as health, parenting, travel, technology, marketing, food, craft and many more. Proactive research will help you find many more opportunities that aren’t widely advertised — which means you’ll be competing with a smaller pool of writers. 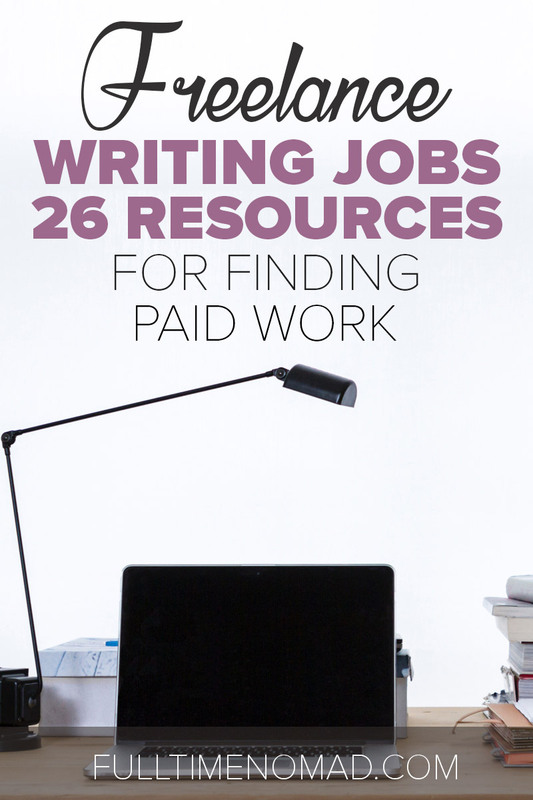 As a start, our friend Kasia has a great list of paying markets for freelance writers. Have you got any other freelance writing job opportunities to share with us? Leave us a comment and we’ll add it to the list. How come You guys didn’t mention fiverr in the list? Hey Maria, have you found good quality writing work through Fiverr?